OK, enough about the boring facts. Hmm…so far we’ve been studying for 1 month. Pretty close knit family. We are all excited, after all we’re going for a 10 hour + plus journey from Kerteh to Bukit Merah via Batang Kali. Our team = me, Azni, Izma, Nue & P1644. Go Go Go Team 119 !!! Take off from Kemaman Centre Point 7.30am. We were all obsessed to be first in the Mystery Drive. And talked big, yes, I mean, boasting hahaha… Who cares, we want to win this badly ! We are already talking about what we should be buying with the winnings… yes, to that extent! We first stop at Temerloh, with the idea that the “Harta Karun” questions must be about food. (It’s true actually) becos we are supposed to submit them (can’t be anything bulky, or expensive – so they must be snacks ! We are geniuses !! ) But then again, every one figured it out later anyway. The road at Batang Kali is winding, and to top it off, we have our rempit queen, Izma on the wheels. You can imagine how thrilling the ride was! And the girls are cracking off with some songs on the radio, while I am battling it off with my MP3 player. Your singing are not awful girls, I don’t mind it – it’s just that I don’t prefer listening to Malaysian radio because they are mostly repeating the same songs which some I could vomit to. I think I have a more extensive record collection than some of the radio stations combined – my, I like to boast huh.. But anyway, I don’t know most of the Malay & Indonesian songs. So, I shouldn’t boast – SORRY. Stop it OK?? We wait for the guys finish Friday prayers, and somehow, forgot to pay for lunch, until it was time to go. Don’t worry, we eventually payed them. 3rd stop is Tapah R&R, where the bulk of the clue is. A lot of teams are already here, and some asked for answers, but because we didn’t have the heart to tell them off, we give some. But they didn’t exchange, so it’s unfair. But we’re confident, so we don’t mind. Later we stroll along the wooded path of Bukit Merah lake, until we got bitten by insects, and have to find some other thing to entertain ourselves, although we know Nue already found her source hehe. OK, after all that sweat, we came back to a cranky air cond in our room, but luckily the maintenance boys were around to give us our beauty sleep. We slept like babies and woke up almost 7am the next day. Tapi bangun solat tau. We woke up with a bad news from Azni. Her grandpa passed away. For the first time I saw Azni cried. I never saw her crying before. We are very saddened by the news. Azni & Izma have to cut short their trip and return to Kerteh right after breakfast. Nue wanted to go as well, I am feeling guilty, as I’m staying. Going back to UTP isn’t really strong an excuse, and I hope Azni & Izma will forgive me for staying back. Me & Nue shift into recluse mode and climbed in our bed. We feel really really nasty for not escorting Azni. After a long call session with Azni (they’re already on their way back), we feel better. We are not going to sulk in bed and we’re gonna win prizes for the sake of Team 119!! We may be separated but our spirits are strong !! Go go Team 119 !! We won 2 prizes !! Not bad!! 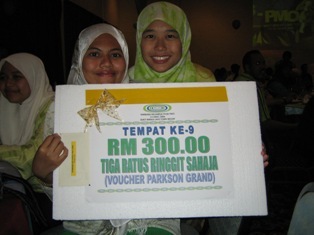 We reserve one prize each for Azni & Izma. 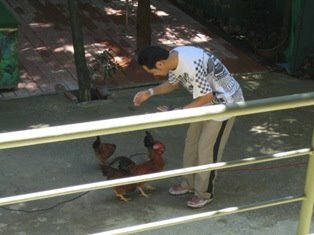 Trip to Eco Park is nice too, especially the Animal Show – Tango & Ronnie the bird (Nue, what type ? You should know) are really adorable. They played bowling (although Ronnie was a bit cheating, using both his/her beak and limbs) , basketball, magic and even doing math calculation! Tango calculated 5 + 70 correctly (although we all have a theory of how Tango did it). As for Ronnie guessing the right bowl containing the ball, we figure that he/she senses the smell of nuts put together with the ball. Hatim does a “stunt” as well – tapping castornet to call a bunch of ayam kampong haha. The animal instructor has a very nasal (sengau) voice. Funny sounding, we all enjoy mocking him (how wicked of us). After feeding, we couldn’t wait to splash in the water, after all Nani is already waiting. Yuz & the brothers persuade me & Nue to try the boomerang. At first we were really scared (it’s really high you know, I always fear free falling – btw, anyone knows the term?) But once we tried, it wasn’t bad at all!! Nue couldn’t even scream (she left behind her high decibel voice). Wish Azni & Izma were here. Azni could have challenged Nue with her high pitch shrieks !!! Then we have fun at the wave pool, the guys are doing some funny synchronized swimming stunts, only they look really ugly (with the hairy legs), and they’re not supposed to lean against the wall!! And Fatin’s brothers won the “Who can hold their breath underwater the longest” As usual, I became the judge, read: always choose the easiest job. After 3 hours of baking under the sun, we have enough. (Dah hitam legam baru sedar diri). Dressing up for the night, I have to ask for Nue’s assistance. ( thanks Nue ). Details not need to be elaborated here. The cartoonist show is kewl – the Corporate Agenda & the rise of Petronas part. Especially funny is the training sketch, complete with Space Cop Gaban soundtrack. A must watch!! And Malaysia Malam Ini with a bogus doctor (Dr Shaari by Padi, very outrageous and Helium induced voice) and Mr Bigfoot (by Gayor @ Slash) as guests. The moment of truth – announcement of Mystery Drive Top 10 winners. We got # 9 – really disappointed !!! It must be all that boasting, serves us right. But we enjoyed the race anyway. Any Amazing Race takers ? It ends too soon. But to complete the roadtrip feeling, we stop at a few places. We have Laksa at Kuala Kangsar (a very clean & beautiful town). Abang Mok is also here. Then the K Kangsar R&R, buying some fruits (I need bananas for my digestion system). From here, it’s straight to UTP via Batu Gajah. Sorry, I know my mom is from Ipoh, but I don’t know the roads here, heck, I don’t even know (much) the roads in KL !! Forgive me. So it’s the end of my tour at the extremely hot mining pools of UTP. We bid farewell, and the guys, & Nue continue their journey. Thank you Azni, Izma, Ju, Yuz, Nazim & Hatim for the enjoyable trip ! Wish to have more trips with you and the rest of the gang yg jadik committee tu.